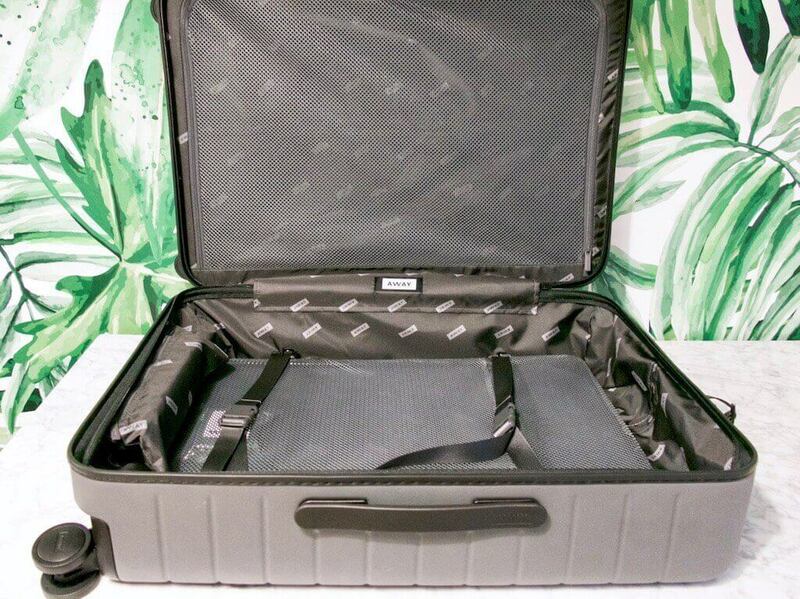 I bought my first piece of Away luggage about a year ago and have waited to write a review until it had gotten a fair amount of use. It’s officially gone through the ringer and I’m happy to report it’s one of the best purchases I’ve ever made. So good, in fact, that I just bought my second piece. I am not being paid to write this review, although if you use my link (and I really appreciate it, if you do), you will receive $20 off your first purchase and I will receive credit as well, so I can continue adding to my collection! The first piece I purchased was Away’s large carry-on. It is technically a little larger than the size specifications set by most airlines for a carry-on, however I have not had a single issue on any of my flights with both domestic and international airlines. Away is primarily an online retailer, but does have stores in San Francisco, Los Angeles, New York City, Austin, and London. Away produces high quality luggage that is high in function and minimal in appearance. The company uses high quality materials, but is able to keep costs low since they are generally direct to consumer. The result being an extremely well made bag at a great price. The bags start at $225 for the regular carry-on and go up to $295 for the largest piece of luggage. The exterior of Away’s bags are made of a hard polycarbonate shell. The shell is lightweight and though it will bend with pressure, it is guaranteed not to break. My bag has been through a lot and has held up incredibly well. My only complaint is that they do scuff and scratch somewhat easily. Away now sends a magic eraser with each bag, which helps clean up minor scuffs. Despite the scratches on my bag, I still think it’s a great and smart looking piece of luggage. The luggage has 360 degree spinner wheels, making it an incredibly easy bag to roll. The wheels glide effortlessly and turn smoothly. I’ve cut it close with a few flights and have found myself running through the airport with this bag. It is a piece of luggage that you can definitely move quickly with. All of Away’s suitcases come with a built in TSA approved lock. The lock is a three digit combination, which you personally set. I love the convenience of this lock. I used to fumble around with luggage locks, which I would often lose, so it’s great having one that’s built in. I don’t have to worry about anyone getting into my bag, except for the TSA. The carry-on bags come with a removable battery. The battery slides right out of the luggage, so there is never any issue if you decide to check your bag. I love having this back-up battery. It’s nice to know I can freely use my phone on my flight and have battery when I land. It charges anything that uses a USB and can charge a phone about five complete times. All bags also include a nice looking, leather luggage and a dust bag for storage! 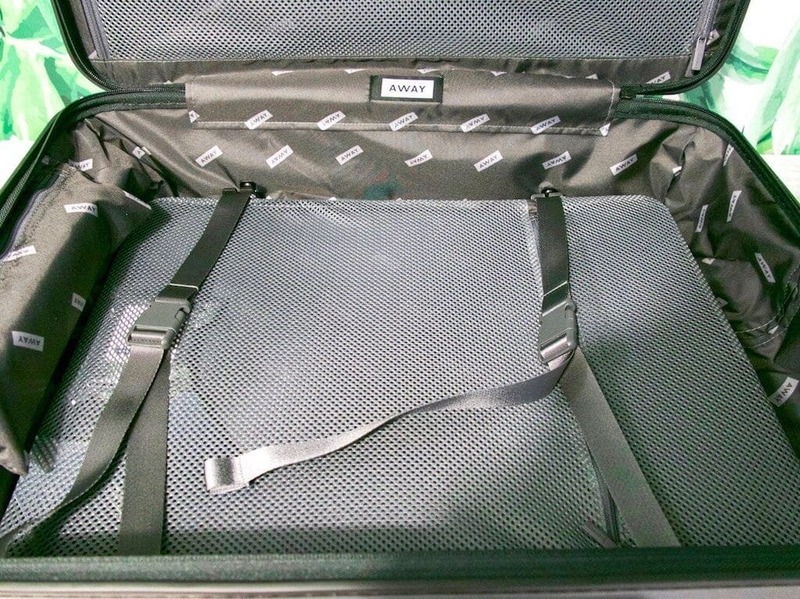 Away’s suitcases open like a clamshell, creating two separate sides or compartments. One side is meant for clothing. The other is for shoes, toiletries and other hard objects. A piece of mesh zips over this second compartment to hold all the items in place. Dividing the two compartments is a compression pad. The pad has a zippered pocket for smaller items, such as books or a tablet. The pad buckles across the compartment containing clothing and the straps are then tightened, compressing everything and freeing up space. This is probably my favorite feature of this bag. The amount of space it can free up is really incredible. I can pack for a two week trip in the large carry-on, if I utilize packing cubes with the compression system. Each bag also comes with a laundry bag that rolls up and neatly clips into place. It’s great for separating dirty clothes or wet swimsuits and is completely removable, so it can be thrown in the wash.
Away offers a lifetimes guarantee on all their bags. This includes any damage to the shell, wheels, handles, zippers and pretty much any part of the bag, except the battery. Away will either repair the damage or replace the entire bag. The battery, which is not covered by the lifetime guaranty, is covered by a two-year warranty. About eight months into having my bag and repeatedly testing its limits, I over stuffed it and broke one of the compression straps. Away was great! Even though it was entirely my fault, they fixed my bag. They didn’t ask any questions and simply sent me a pre-paid mailing label to ship it to them. I had the bag back within a week, completely repaired. The whole process was incredibly smooth. Away offers great customer service. Email responses are timely and every time I’ve visited a store, I have had a great experience. Away also offers a 100-day trial. If you do decide to purchase a bag, it is returnable any time within the first 100 days for a full refund. The luggage can be returned for any reason with no questions asked. I really can’t recommend Away’s luggage enough. It’s lightweight, looks great and performs well. I also recommend checking out their Everywhere Bag. It’s the perfect travel tote and addition to your luggage! Please use this link to receive $20 off your first purchase!